Vietnam Airlines plans to resume long-haul expansion in 2015, ending a hiatus of over two years caused by delays in the 787 and A350 programmes. Vietnam Airlines now expects to begin taking 787-9s and A350-900s in 2Q2015 with eight deliveries slated for 2015 including four growth aircraft. The government-owned flag carrier has been focusing in recent years on short-haul and medium-haul expansion using its A321 fleet. Long-haul expansion is now becoming critical for Vietnam Airlines to raise its global profile and head off Vietnam’s second largest carrier VietJet Air, a fast-expanding LCC which is also now planning to expand internationally into long-haul markets. Intensifying competition clouds Vietnam Airlines’ prospects as it plans for an initial public offering (IPO) in mid-2014. The Vietnamese market has huge growth potential but with LCCs and foreign full service carriers becoming more intrusive, Vietnam Airlines has challenges to overcome as it starts to accelerate expansion. CAPA will shortly publish a comprehensive report covering Vietnam's aviation and tourism industries. This will include analysis and data relating to Vietnam's airline, airport, tourism and hotel accommodation sectors. For further information about the Vietnam Outlook Report, please contact us. Vietnam Airlines currently has an in-service fleet consisting of 83 aircraft, including 18 widebody aircraft, 53 narrowbody jets and 12 turboprops, according to the CAPA Fleet Database. The carrier’s last two Fokker 70 regional jets were withdrawn from service on 30-Mar-2014. Note: *Firm orders include those placed directly by the operator and by lessors assigned to the operator. While Vietnam Airlines has been rapidly expanding and renewing its narrowbody jet fleet, it has not taken a widebody aircraft since 2011. The carrier’s last widebody deliveries consisted of two A330-200s in 2H2011. Vietnam Airlines also operates nine 777-200s, the last of which the SkyTeam carrier took back in 2005. Meanwhile, Vietnam Airlines took delivery of 11 A321s in 2012 and eight more in 2013, according to the CAPA Fleet Database. Two more A321s were added in 1Q2014. The final five A321s from its current order book are for delivery by the end of 2015. The airline has a new narrowbody fleet with its A320 family aircraft currently less than five years old on average. 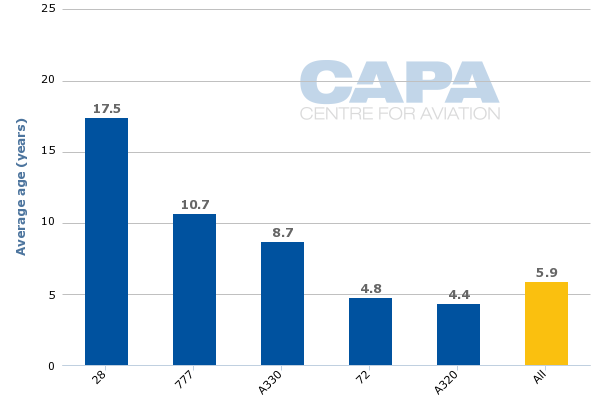 Its 777-200s are between eight and 15 years old with an average age of 11, according to the CAPA Fleet Database. Its nine A330s are between two and a half and 15 years old with an average of nine. All of Vietnam Airlines’ A330s and 777s are leased. Vietnam Airlines' CEO Pham Ngoc Minh tells CAPA the carrier plans to replace all 18 of its current widebody aircraft by the end of 2018. But there will also be growth opportunities as the carrier has committed to acquiring 30 new widebody aircraft, including 14 787-9s and 16 A350-900s, according to the CAPA Fleet Database. The first four of these growth aircraft will come in 2015 as Vietnam Airlines plans to take eight 787-9s and A350-900s in 2015 while phasing out only four of its existing A330s/777s. Mr Minh says the airline’s first 787-9 is now slated to be delivered in May-2014 while its first A350-900 is for delivery in Jun-2014. He says Vietnam Airlines expects subsequently to take another six 787-9s/A350-900s in 2H2014 with one delivery every month. Mr Minh says the four growth aircraft will enable Vietnam Airlines to resume expansion of its long-haul network after a two and a half year hiatus. He says the carrier is now reviewing which markets to add capacity in, with a decision expected within the next few months. Additional capacity to Europe and Australia are under consideration as well as the launch of flights to the US, but the airline is approaching decision making cautiously. “We have to review this carefully. We may announce this by this summer,” Mr Minh says. Flights to the US will only be possible if Vietnamese authorities succeed at securing a Category 1 safety ranking from the US FAA. Vietnam Airlines currently only serves four destinations in Europe – Frankfurt, London, Moscow, Paris – with a combined 28 weekly frequencies. This includes 10 weekly frequencies to Paris, seven to Moscow, seven to Frankfurt and four to London, according to OAG data. Vietnam Airlines also serves two destinations in Australia, Melbourne and Sydney, with one daily A330 flight to each destination. Australia currently accounts for less than 5% of Vietnam Airlines’ international seat capacity while Europe accounts for just over 10%. Asia accounts for an overwhelming 85% of international seat capacity at Vietnam Airlines. This is the highest Asia market concentration among the seven Southeast Asian flag carriers with widebody operations – Singapore Airlines, Thai Airways, Malaysia Airlines, Philippine Airlines, Garuda Indonesia, Vietnam Airlines and Royal Brunei Airlines (in descending order based on size of widebody fleets). Vietnam Airlines has been keen to expand its long-haul network, including the launch of US flights, since ordering 787s in 2005. The Vietnamese government also has been keen to use Vietnam Airlines to raise Vietnam’s profile abroad and boost tourism. As with most fast growing aviation industries in the region, airport infrastructure is hurrying to try to catch up to the new demand. Ho Chi Minh is no exception, particularly as the government has aspirations for it to become a transit hub rivalling Bangkok and Singapore, leveraging Vietnam’s central location in Asia. According to CAPA's Airport Construction & CAPEX Database, in Mar-2014 Airports Corporation of Vietnam (ACV) chairman Nguyen Nguyen Hung said it would be necessary to expand Ho Chi Minh City's Tan Son Nhat Airport to meet demand ahead of the opening of the planned new Long Thanh International Airport. Tan Son Nhat Airport reached its current annual capacity of 20 million passengers in late 2013. The new airport has planned capacity for up to 100 million passengers per annum, but will not be onstream for some years to come. Meanwhile, Tan Son Nhat is receiving a terminal and apron expansion designed to increase annual throughput capacity to 26 million by the end of 2016. Frustratingly for Mr Minh, who is one of the longest standing airline CEOs in Southeast Asia, multiple delays in 787 deliveries have forced the carrier repeatedly to push back long-haul expansion. The carrier has not added long-haul capacity since launching London Gatwick service at the end of 2011. Vietnam Airlines has since looked at interim widebody leases to fill the gap while it waited for 787s and A350s but Mr Minh says the period the carrier required the additional aircraft was too short for new leases and therefore it decided it would instead “almost freeze” long-haul growth. As Vietnam Airlines has waited for its new-generation widebody aircraft, Gulf carriers have rapidly expanded, capturing most of the growth in the Vietnam-Europe market. Emirates launched services to Ho Chi Minh in June-2012 and Etihad followed in Oct-2013. Qatar Airways has been in the Vietnamese market longer, since 2007 and has added capacity in recent years. Turkish Airlines also launched services to Vietnam in late 2010 but currently only serves Ho Chi Minh via Bangkok. Lufthansa also served Ho Chi Minh via Bangkok but dropped the service on 25-Mar-2014, ending over two decades of service to Vietnam. Air France is now the only Western European carrier serving Vietnam. Air France and Aeroflot are also the only European carriers currently operating non-stop services to Vietnam. United Airlines is the only North American carrier serving Vietnam but serves Ho Chi Minh via Hong Kong. Northwest Airlines pulled out of Vietnam after it was acquired by Delta Air Lines while Jetstar Airways, which was the only Australian carrier serving Vietnam, dropped Ho Chi Minh in 2012. The dearth of long-haul services from foreign carriers and the freeze in long-haul expansion at Vietnam Airlines has created a potential opening for independent LCC VietJet, which launched services at the end of 2011 and currently operates a fleet of 12 A320s. 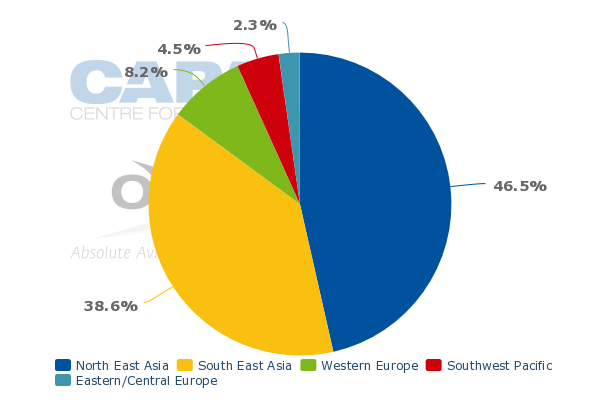 As CAPA reported in the first in this series of outlook analysis pieces on the Vietnamese market, VietJet is now almost entirely a domestic operator but is now starting to turn its attention to international expansion. VietJet intends to use A320s to launch new destinations in North and Southeast Asia and is also planning a new widebody operation which is expected to launch services to Europe, Australia and North America within three years. If Vietnam Airlines had been able to pursue long-haul expansion over the last couple of years, it would potentially have been more challenging for VietJet to enter the market. Now Vietnam Airlines faces the prospect of competing with its emerging rival on new long-haul routes just as it finally is ready to expand its own widebody operation. Vietnam Airlines originally expected to take 787s from 2009. A combination of repeated delays in the 787 development programme and the carrier’s 2010 decision to switch its 787 order from the -8 to the larger -9, which it blamed at the time on performance limitations with the -8, resulted in first delivery being pushed back by six years. Vietnam Airlines originally ordered four 787-8s back in 2005 and ordered four more in 2007. Vietnam Aircraft Leasing also ordered eight 787-8s in 2007 with a commitment to place the aircraft at Vietnam Airlines. ALC took over the Vietnam Aircraft Leasing order in 2012, after all the orders had been converted to -9s. Also in 2007 Vietnam Airlines placed orders with Airbus for 10 A350-900s for delivery from 2014. The carrier subsequently also committed to leasing four A350s, including two from CIT and two from ILFC. Delays in the A350 programme have driven a one-year delay to Vietnam Airlines deliveries. Vietnam Airlines was originally planning to take the A350s about five years after the 787s. With both 787s and A350s now slated to arrive within one month of each other in 2Q2015, Vietnam Airlines faces the challenge of having to introduce two new aircraft types almost simultaneously. This is not an ideal situation but the carrier is prepared and is confident it can rise to the challenge. Both new widebody types will be used on similar missions, with the A350 offering slightly higher capacity. In addition to long-haul routes to Europe (A330 to Moscow, 777 to Western Europe) and Australia (A330), Vietnam Airlines currently uses widebody aircraft on selected North Asia flights including some but not all frequencies to Beijing (777), Osaka (A330), Seoul (A330) and Tokyo Narita (A330). The impact of the delay in widebody fleet expansion shows clearly in the airline's international capacity growth record; international ASKs were up only 5% in 2013 and 4% in 2012, following high double digit growth in 2010 and 2011.
International passenger traffic was still up 13% in 2013 to 5.9 million passengers. But the growth was driven by additional flights within Southeast Asia and to North Asia using the expanded A321 fleet. 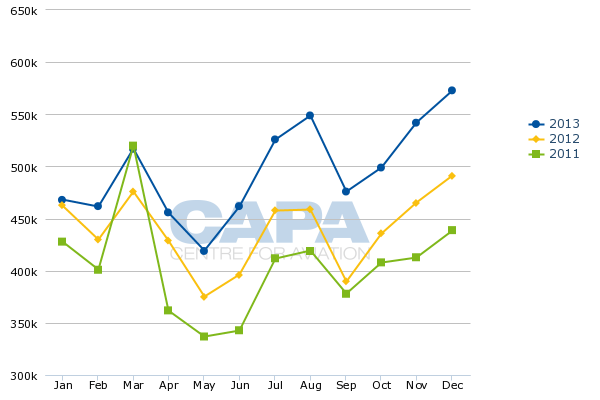 Vietnam Airlines has increased capacity to North Asia by 11% since Mar-2013, according to CAPA and OAG data. China has grown the fastest with capacity up 26% year over year while Japan has grown by only 4%. 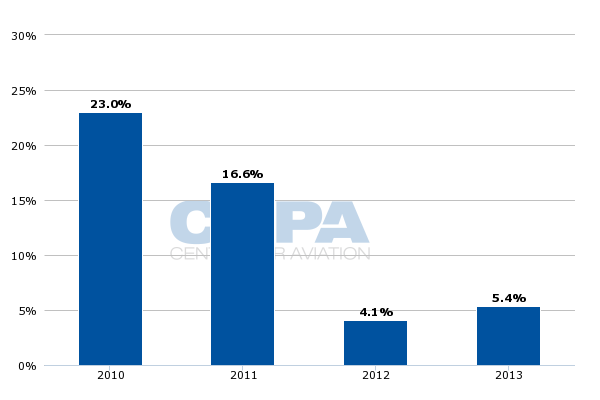 Vietnam Airlines now accounts for a 55% share of capacity in both the Vietnam-Japan and Vietnam-China markets. China now accounts for about 12% of Vietnam Airlines’ total international seat capacity, making it the carrier’s third largest market after Cambodia and Japan, which each account for about 13%. A large part of the China growth has come from Vietnam’s third largest city Da Nang, which has emerged as a popular holiday spot for Chinese tourists. Vietnam Airlines currently serves eight cities in mainland China from Da Nang, including some seasonal services, according to OAG data. Some of these destinations are only served from Da Nang rather than the carrier’s larger hubs at Ho Chi Minh or Hanoi. The most recent route launches for Vietnam Airlines includes Da Nang-Tianjin on 15-Mar-2014 and Da Nang-Fuzhou on 31-Mar-2014. Vietnam Airlines also recently unveiled plans to begin serving Tokyo Narita from Da Nang with four weekly A321 flights starting 16-Jul-2014. Vietnam Airlines now has five international gateways, including Ho Chi Minh, Hanoi, Da Nang, Nha Trang and Vinh. Vietnam Airlines began international services at Nha Trang in 2013 with a route to Moscow and at Vinh in Jan-2014 with a route to Vientiane in neighbouring Laos. While much of the growth over the past year has been in secondary gateways, the focus is expected to shift back to Ho Chi Minh and Hanoi as long-haul expansion resumes in 2015. Ho Chi Minh will also see some expansion in 2H2014 as a daily A321 service to Tokyo Haneda is launched on 1-Jul-2014, giving Vietnam Airlines five destinations in Japan. The forthcoming long-haul expansion, along with plans for a partial privatisation, will mark the start of a new era for Vietnam Airlines. The Vietnamese Government has been planning to privatise the carrier since 2007. After repeated delays in searching for a strategic partner and more recently pursuing an initial public offering (IPO), which was previously planned for 2013, the carrier finally seems ready to proceed. Vietnam Airlines claims to have been consistently profitable over the past several years, giving it confidence it will ultimately succeed at partially privatising. Mr Minh says the IPO is now on track for the end of 2Q2014. The government is keen to sell a stake in the carrier along with other state-owned companies as part of a move to increase transparency. The IPO, along with a possible sale of a strategic stake which Vietnam Airlines remains open to considering, is also aimed at helping the carrier compete more effectively in the increasingly crowded Asian marketplace. If it goes ahead, the IPO could raise capital to fund expansion. Perhaps even more significantly the IPO would also put Vietnam Airlines on a more equal playing field with Southeast Asia’s other five main flag carriers, all of which are now publicly traded. As it enters a new phase Vietnam Airlines is confident it can tap into rapid growth in its home market using both its main full-service brand and its JV budget brand Jetstar Pacific, which is 70% owned by Vietnam Airlines and 30% by Australia’s Jetstar. Vietnam Airlines sees opportunities in both ends of the market as it looks to accelerate expansion and take on fast-expanding rivals. Vietnam Airlines has a bright future as it has a leading position in one of the world’s fastest growing markets, with about a 62% share of domestic capacity (75% when also including Jetstar Pacific) and 40% of international capacity. But there will be challenges as Vietnam Airlines comes under the spotlight of a public listing and grapples with the strongest local competitor it has ever seen. In the third and final part of this series of analysis reports on the Vietnamese market, CAPA will look at the outlook for Jetstar Pacific as it starts to pursue expansion after several years of limited to no growth.